A focus on trade, taxes, immigration, and R&D in discussions with U.S. policymakers. 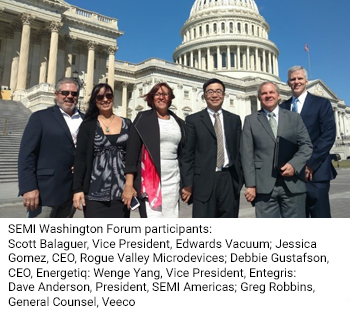 SEMI hosted 24 industry executives in Washington, DC on March 28 & 29 to take part in the annual SEMI Washington Forum. The Washington Forum, which is supported by SEMI’s North American Advisory Board (NAAB), gives SEMI member company executives a chance to come to the Nation’s capital for a firsthand experience in engaging policymakers on the issues that are pertinent to the industry. In all, the group met with 20 members of Congress and their staffs from all over the country with representation from Arizona, California, Colorado, Massachusetts, Missouri, New York, Oregon, & Texas. The group brought with them the issues of the day that are most affecting our industry, including concerns about international trade, tax reform, high-skilled immigration, and federal funding for research and development. SEMI is deeply committed to working closely with the U.S. government to pursue beneficial trading relationships around the world. Our industry is a global one, with nearly 85% of all equipment and materials manufactured in the U.S. being exported. We need trade policies that open foreign markets so the semiconductor products manufactured in the U.S. are the products of choice around the world. Unfortunately, after years of pro-trade policies coming out of Washington, the rhetoric coming off of the 2016 campaign and into the new administration is cause for industry to raise its voice and push back against harmful policies. In fact, there is great concern that the President’s isolationist strategy will inhibit growth and lock American companies out of opportunities in the global marketplace. The Trump Administration has launched a process to reconsider key trade agreements such as NAFTA and US-Korea Free Trade Agreement (KORUS), withdrawn from the world’s most commercially significant multilateral deal in the Trans-Pacific Partnership (TPP), and has threatened a trade war with China. It is with these actions in mind that the Washington Forum participants brought a message to policymakers about the positive benefits for economic growth from trade, using our own industry as the poster child for a “Make it here; Sell it there” strategy. With 47% of the world’s production of semiconductor equipment, the U.S. actually has a trade surplus in our industry with many of the countries that we have an overall trade deficit. Lowering the Rate: While the top corporate tax rate in the U.S. is 35%, the average rate for other industrialized nations is 25%, and dropping. Proposals from the House Committee and Ways and Means suggest that the top rate be 20%, while President Trump’s plan goes even further with a proposed 15% rate. Move to a Territorial Tax System: The U.S. tax system currently operates on an island when it comes to sharing rules with the rest of the world. This creates an overly burdensome and onerous system. The U.S. should move to a territorial system to bring it in line with the rest of world, and make taxation fairer and more competitive. Border Adjustment Tax (BAT): More details are needed from the Ways and Means Committee to fully understand the impact of the novel BAT, but SEMI urges the committee to move forward with its work and the work of the Senate Finance Committee to move forward on tax reform and let the legislative process work out the details. Repatriation: U.S.-based companies do not pay U.S. corporate tax on their foreign profits until the profits are “repatriated” to the United States. As a result, many firms have large amounts of cash “stuck” overseas. SEMI supports repatriation, but would like to ensure some flexibility in the provision to ensure that the “deemed” repatriation does not cause an overwhelming tax burden. R&D Tax Credit: The Research and Development Tax Credit is expected to be retained in any tax reform package, however SEMI asks that the Alternative Simplified Credit (ASC) be increased from its current 14% to the 20% deduction of the regular credit. High-skilled immigration reform was also on the agenda. For many years SEMI and other high tech partners have lobbied to increase the cap on the annual number of H1-B visas that are granted under a general atmosphere that reform was needed, but was not politically expedient while other matters of immigration were more much more controversial. Unfortunately, the dialogue has sharply changed in the last year, and even more so since the 2016 elections. While the H1-B visa program was almost universally championed in the past, the need for the program is now being openly questioned by some leaders in Congress as well as in the White House. As part of the Forum, participants met with multiple members of Congress who have their own bills to push H1-B reform, including Rep. Zoe Lofgren (D-CA-19) and Rep. Darrell Issa (R-CA-49). While there is bipartisan support for reform, the challenge remains getting policymakers to agree to a path forward, while fighting emerging forces who want to restrict immigration across the board. Another top priority for the trip was to support for federal funding of R&D. Federal R&D funding plays a critical role in U.S. competitiveness and future economic prosperity. As such, full funding of R&D programs at the National Institutes of Standards & Technology (NIST) and the National Science Foundation (NSF) were also a focus of the meetings with policymakers. In addition, the federal government has the opportunity to bridge the gap between basic research and commercialization with programs like the Manufacturing USA program which focuses on public-private partnerships to support advanced manufacturing. A point of particular timely concern for the group was discussion of President Trump’s so-called “Skinny” Budget. With a significant increase in defense spending, the Trump budget proposal remains deficit neutral by sharply cutting non-defense discretionary spending. This includes a 17% cut to the Department of Energy, Office of Science, and an 11% across the board cut to NIST. The NSF, which has an annual budget of $7.6 Billion, received no mention the Trump budget. While these cuts aren’t expected to be approved by Congress, smaller cuts may be made to try and defer to the President’s request. 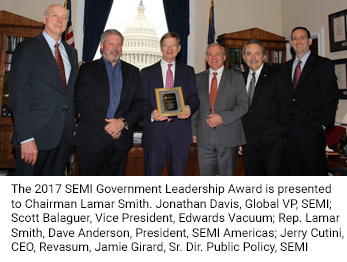 In addition to meeting with members of Congress, the SEMI NAAB used the occasion to present the 2017 SEMI Government Leadership Award to the Chairman of the House Committee on Science, Space, & Technology, Rep. Lamar Smith (R-TX-21). 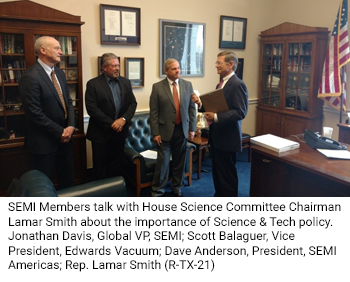 Chairman Smith has been a longtime supporter of high tech, intellectual property rights, and was the champion of the Revitalize American Manufacturing and Innovation Act which authorized the Manufacturing USA program. The SEMI Washington Forum is an annual event hosted by the North American Advisory Board, which brings SEMI members executives to Washington to give them a firsthand experience with addressing policymakers. It also gives our elected officials a chance to hear straight from their constituents, and learn more about our important industry. If you would like to learn more about the Washington Forum and how someone from your organization can participate in the future, please contact Jamie Girard, senior director, Public Policy, at [email protected], or by phone at 202.393.5552. Jamie Girard is a senior director of public policy at SEMI, where he advocates on behalf of the industry with federal policymakers as the organization's lead liaison with the U.S. Government. Prior to joining SEMI, Girard was senior legislative assistant for Rep. Lynn Woolsey (D-CA) and was her dedicated staffer for the U.S. House of Representatives Committee on Science & Technology. He holds a degree in political science from Bates College, located in Lewiston, ME.